You’re right, Ruth we had a very peaceful lunch at the lake. 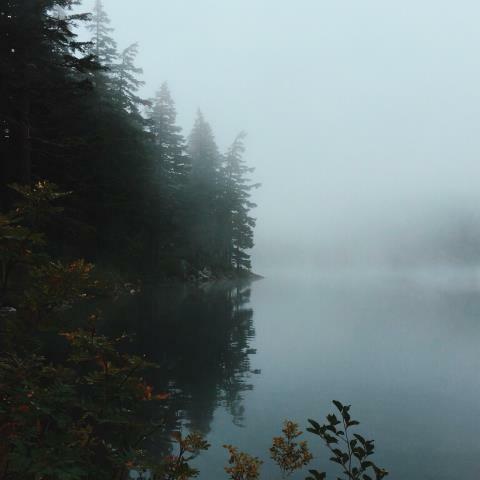 I love the texture of the mist in this photo. Haunting! You struck gold with these compositions. That’s the look of the west coast right there. “Play misty for me”. 🙂 Beautiful photo. Such a lovely, peaceful photo, Lisa. Wonderful to hear you enjoyed it, Janet. I can feel the dampness in this one. Such delicate watercolors. Thanks, D’Arcy. :). The soft colors were really pretty around the lake. So peaceful, and yet a bit eerie and tinged with mystery.